When we started Helmsie, Karla and I were influenced most by the collective places that we have lived throughout the South. We love the traditions, the unique design, and the rich history of southern towns and cities. Each place, big and small, has its own story and identity that makes it special to the people who call it home. One thing that I, Sarah, love about the South are the traditions that get passed from generation to generation. I grew up in a small town in Tennessee and you will find an abundance of tradition there. Another thing I love is getting to see my kids experience said traditions. When my Dad, Jim, was little, he and his dad were out mowing the lawn when the mower died. So, they hopped up into my Grandfather's truck and headed into town to buy another. Hours later, my Grandfather returned with no mower and no Jim. Casually, he explained to my Grandmother that Jim was making his way back from town (miles from their house) on his new bike. By himself. Ha! I heard this story so many times growing up, but have a new appreciation for how my Grandmother must have reacted now that I am a mother myself. So, the story goes in my family: you go to town to buy a lawn mower and come home with a new bicycle. This pretty fairly sums up my childhood. My son, Helms, turned four at the end of June and he had been begging us for a bike for some time. We already had a trip planned to visit my parents on his birthday weekend and I knew the perfect way to surprise him. 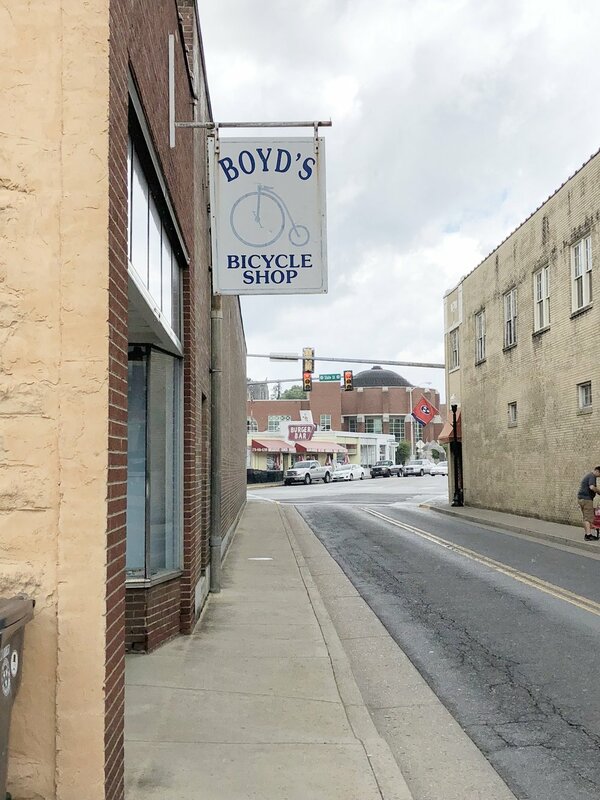 The place where my dad picked out his bicycle (in lieu of a mower) all those years ago, Boyd's Bicycle Shop, is actually still in business right off of State Street in Bristol, TN. It is even owned by the same family. That Saturday morning, my Dad told Helms that his lawn mower had broken and we needed to head into town to buy a new one. Guess where we ended up? Don't worry, both Helms and the bike rode in the car all the way home to Atlanta! Trying out a few to find the perfect fit! Find a splash pad and be a regular. These little water-splashing, concrete pads are a toddler oasis. Not to mention, there are usually some cool mom pals that you can stalk befriend. If you find yourself in the ATL area, the Atlanta Zoo near Grant Park has a lovely splash pad. Puppet show or Playhouse. This is one of our very favorite things we have done in the city. Most larger cities will have them and they are a wonderful way to take up a morning. The Center for Puppetry Arts is the place to be if you are near Atlanta. I think I enjoyed the show as much as my toddler! Find a large, open indoor space with air conditioning and let them roam free (while staying two feet from them always, of course). For you, this might be a mall or an area gym. For us, this is most certainly Ponce City Market. We like to go super early in the A.M. before it gets crowded and make laps around the food hall. My best mom friend and I grab a latte and spend the next hour or so chasing some toddlers around in circles. It's glorious. Bring the toys to the park! This is one of our new favorite pastimes. Maybe everyone has been having a blast doing this all along, but we are fairly new to this club. If your kid is like mine, I spend 98% of our time at the park chasing him around and rescuing him from falling off the "big guy" slide. Enter bulldozers, dumptrucks, and toddler golf clubs. 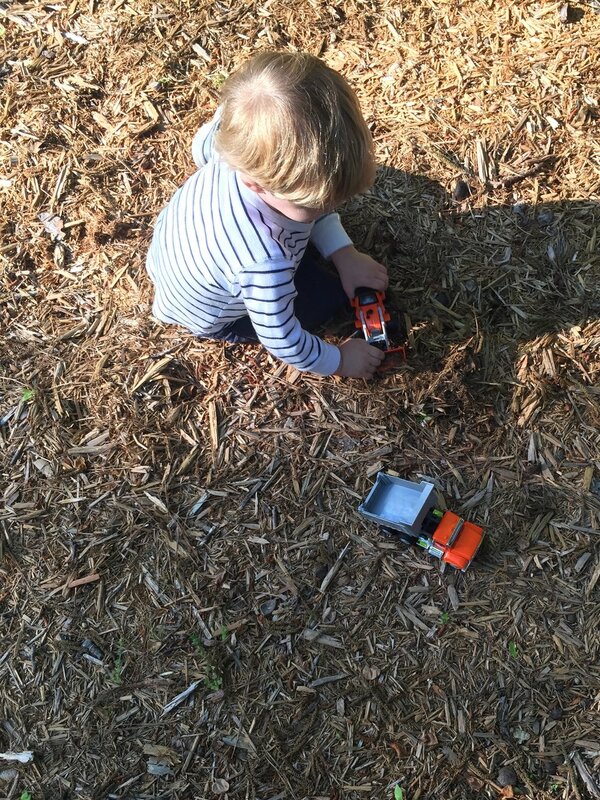 I throw them in the stroller and no joke, my almost three year old will spend nearly an hour digging in one spot. ALL THE PRAISE HANDS! The Farmers Market. This is a weekend go-to for our family. Nearly every city will have at least one, so just do a quick Google search. Ours normally sports live music, fresh treats, and all the puppies that one toddler can handle.